It’s never a good sign when it takes you months and months to read a book. It’s an even worse sign when that book is a graphic novel. 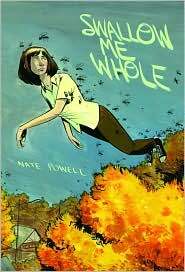 But it took me roughly three months to claw my way through Nate Powell’s Swallow Me Whole. This book was lauded by most everyone who wrote about it. I learned this only because I had to do some googling to figure out the hell I just read. The veneration was my first surprise. My second was that the main characters, teenagers Perry and Ruth, are step siblings. That second surprise made me like the book even less than I thought I did. What we have here is a sort of coming of age of two southern teens, both afflicted with schizophrenia to some degree. I’m not sure if there are varying degrees of schizophrenia, but I’m willing to give Powell a buy on that. I’m not willing to give him a buy on the utter coincidence of the step siblings both having schizophrenia, unless their parents met at some sort of support group. If that’s the case we should know that. Anyway the book is a sort of jumbled mishmash of coming of age and mental illness and sick family members. It opens with Ruth and Perry’s dying grandmother coming to live with them. She’s not as near her deathbed as we’re led to believe, because it takes her years and years to die. In the meantime, we find out that both Perry and Ruth suffer from hallucinations. Ruth often sees insects everywhere, and she’s concerned with them, so she has a touch of the OCD with her schizophrenia. Perry’s illness manifests itself in the form of a tiny, pencil-topped wizard who forces Perry to do his bidding. Even though I found the novel on the whole a confusing mess, the scenes with Perry trying to resist the mandates of the wizard are pretty great. But the rest is just kind of okay, at best and pretty boring its worst. I can’t quite figure out why this book garnered so much acclaim, the art is kind of muddy and the story is muddled. This is one I should have just given up on, but refused to be beaten by a graphic novel. Lesson learned, it’s okay to give up on graphic novels you aren’t enjoying.